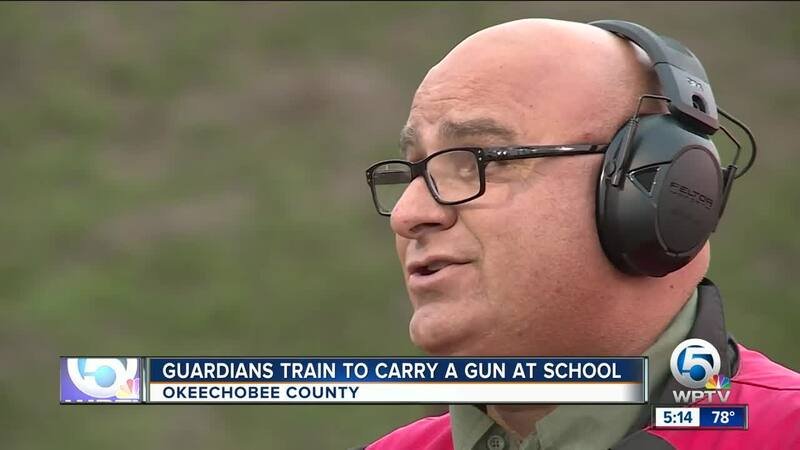 Guardians train to carry guns on school campuses in Okeechobee County schools. OKEECHOBEE COUNTY, Fla.-- They volunteered to keep your kids safe and now select school staffers in Okeechobee County are training to carry a gun on campus. The Okeechobee County School District and the Okeechobee County Sheriff’s Office opted into the Coach Aaron Feis Guardian Program provided by the Marjory Stoneman Douglas High School Public Safety Act passed last year. Through the program, school staff members who are not teachers train to carry a gun on campus. Okeechobee County Sheriff’s Office firearms instructors are now training the first guardians of the district. Some of the guardians have little to no experience with guns and some could not wait to sign up for the program. “I had it completed in 24 hours, the application,” said a guardian who under the program remains anonymous to all school staff except for their school’s principal. All of the Okeechobee County school employees who volunteered, did it for one mission. “I believe in protecting the kids in our school,” said the guardian. After the school shooting in Parkland, state legislators passed the Marjory Stoneman Douglas High School Public Safety Act. It not only required every school to have a school resource officer, but also allowed the school districts and sheriffs to opt into the Coach Aaron Feis Guardian Program. The program allows select employees to train to use a gun and carry one on campus. “The Senate bill explained that it cannot instructional school board employees these had to be custodians, these had to be administrators,” said Okeechobee County Sheriff Noel Stephen. Sheriff Stephen said all guardian volunteers go through an interview and background check process. The guardians have to go through 140 hours of firearms training. “If they can’t master the skills, then they will not be a guardian,” said Hazellief. Aiming and pulling the trigger is just part of it. Training supervisor Hazellief says they are going through active shooter scenarios. “You’ve heard of tunnel vision, auditory exclusion, your heart races, all these things that happen you need to be prepared for that. The time to prepare for that is not when you‘re in the situation,” said Hazellief. Some local sheriffs are critical of the program and believe trained law enforcement officers should be the only ones with guns on school campuses. Sheriff Stephen believes training civilians to stop an active shooter can save lives. For the guardians and the deputies who have children in the school district, this program is a step in the right direction. “I honestly believe in this mission I think for us to sit back and just hope it’s going to disappear that’s not really a solution,” added the guardian. The guardians are receiving a one-time $500 stipend. The public safety act allocated $67 million for sheriff’s offices to establish the guardian program. Governor Ron DeSantis is proposing to use $57 million of the unspent funds to get more districts to participate.